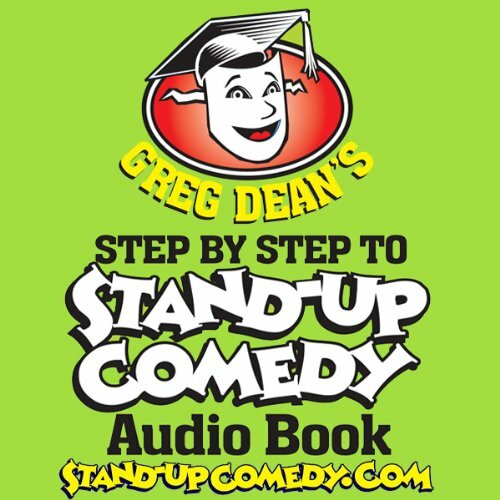 Step by Step to Stand-Up Comedy, written by Greg Dean, is a comprehensive guide for people who are funny, want to be funnier, or have dreams of being a stand-up comedian. This first-of-its-kind audiobook demystifies the craft of comedy by breaking it down to the fundamental skills used by professional funny people. Dean lays out these skills in simple-to-understand lessons that are easy to practice and master. Dean's original joke diagram explains how jokes are built around two interpretations of one magical element called the connector. You'll learn how to see both the expected interpretation and the unexpected reinterpretation of the connector. And you'll be writing jokes after just one listening. Dean also teaches "act outs" by explaining points of view (POVs). Act outs are the quick scenes comics act out during a routine. The three POVs inside a scene are the fundamental tools for understanding why act outs are so funny. You'll learn how to form jokes by shifting form one POV that creates an expected interpretation to another POV that reveals an unexpected interpretation. It's fun and easy, and it works. This audiobook also covers rehearsal, so you can remember your jokes in the same way as you tell a funny story in a social situation. Dean explains how the mind normally remembers in pictures, sounds, and feelings, and then forms those thoughts into words. Memorizing words changes the function of the mind and the sense of humor. Dean offers a simple method for turning every joke into a scene so you can remember in pictures, sounds, and feelings, and tell the story of your jokes. Memorization becomes almost automatic ! Step By Step to Stand-Up Comedy also covers overcoming stage fright, handling hecklers, coping with going blank, dealing with bombing, riffing with the audience, crossing the hurt line, and getting experience. Learn in hours of listening what most comedians learn through years of stage time.